ST. PETERSBURG, May 27. /TASS/. 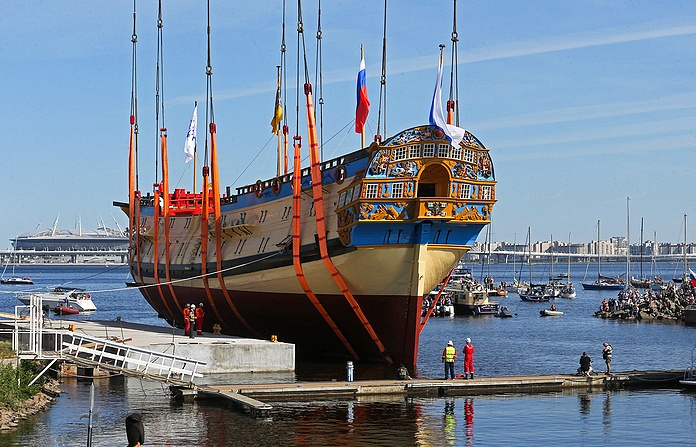 The Poltava, a replica of Russia’s first 54-gun battleship of the same name built in the Peter the Great times, was floated out in St. Petersburg on Sunday. "Russia’s glorious naval victories were forged at Petersburg’s shipyards. The 54-gun battleship Poltava was the first to be built at the Admiralty Shipyards. Now, 300 years after that, we decided to make a replica of that legendary ship in a show of respect. The ship was named after Russia’s glorious victory over Sweden in the Battle of Poltava. History of the Poltava ship is a glorious page in history of the Russian Navy. It is a legendary ship among much more other legendary ships," CEO of Russia’s gas giant Gazprom Alexei Miller said at a floating-off ceremony. "We see a unique ship - it is a full-scale replica of Russia’s first battleship that was built according to the design and with personal participation of our great Emperor Peter I," said Commander-in-Chief of the Russian Navy Vladimir Korolyov. The Poltava, Russia’s first battleship, was floated out at Petersburg’s Admiralty in 1712. The design was drawn by Czar Peter the Great. The ship took part in the Great Northern War between Russia and Sweden and was operational till 1725 to be disassembled in the 1730s when it went obsolete.